Karma is one of those mystical concepts I happen to believe in. It’s not so much that you won’t suffer, or won’t die horribly of cancer, or that there is some eternal reward. More, the actions you take in this life will reap rewards in this life – there is only one life, after all. And, thankfully, at a conference on turning biomass into energy, a number of years ago now, I happened to meet Andrew Lang. He doesn’t remember, but I do. And that’s the important thing. So, here’s his schpiel on a really good idea. It’s such a good idea I can’t imagine why anyone wouldn’t want to gain just a little bit more good karma and vote for it. “While we should be hearing from government and media about good facts on the development elsewhere of renewable energy, energy efficiency, and the jobs and benefits that can come from this, it is unfortunately not the case. As with commercial mushrooms, Australians are kept in the dark and fed only with horse manure. So Sweden is not a country we hear a lot about in regard to its achievements in reducing national and per capita greenhouse gas emissions by development of renewable energy, public transport and energy efficiency. We don’t hear about the simple and effective carbon tax implemented in 1991; we don’t hear about the legislation that banned land-filling of municipal waste; and we don’t hear that, now, biomass is the greatest source of the country’s primary energy (the combined total of electricity, heat energy and transport fuels), significantly exceeding either fossil fuel or nuclear energy. We don’t hear that in Sweden, which is double the population and the size of Victoria, that the per capita GHG emissions are only about six tonne CO2-e; about half that of Europe (11 tonne) and a quarter that of Australia (about 28 tonne). We don’t hear that almost half of all new cars sold in Sweden are able to run on the low emission fuels of ethanol, bio-methane or biodiesel. We don’t hear that, of Sweden’s final energy (energy actually utilised), renewable energy currently makes up over 46%, with 34% of this from biomass, 10% from hydro and only 2% from wind. And we don’t hear of Sweden’s target for cessation of imports of fossil fuels of any type by 2030. This includes coal, fuel oils and fossil-sourced transport fuels. 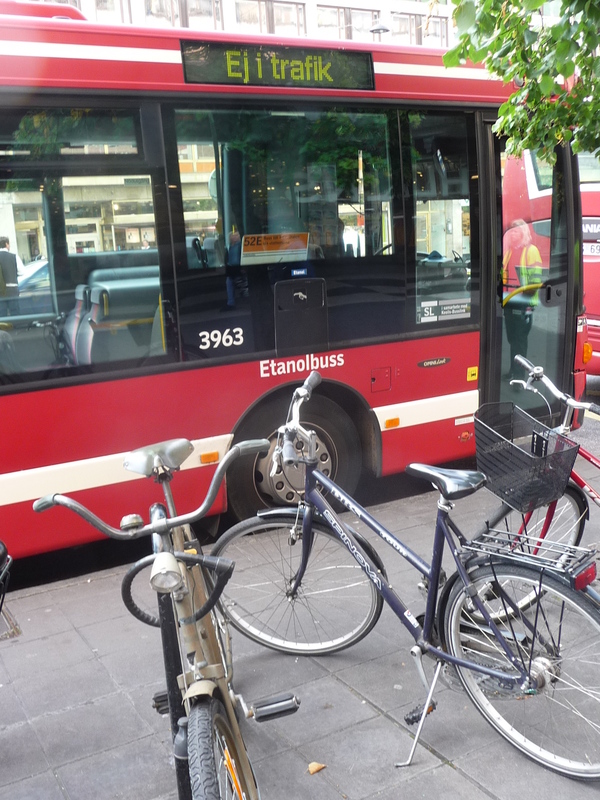 Already, in Sweden’s largest cities of Stockholm, Goteborg, Malmö and Uppsala, municipal fleets run on upgraded biogas, and city buses are running on either 100% ethanol, or biomethane, or in some cases, a methane-natural gas mix. 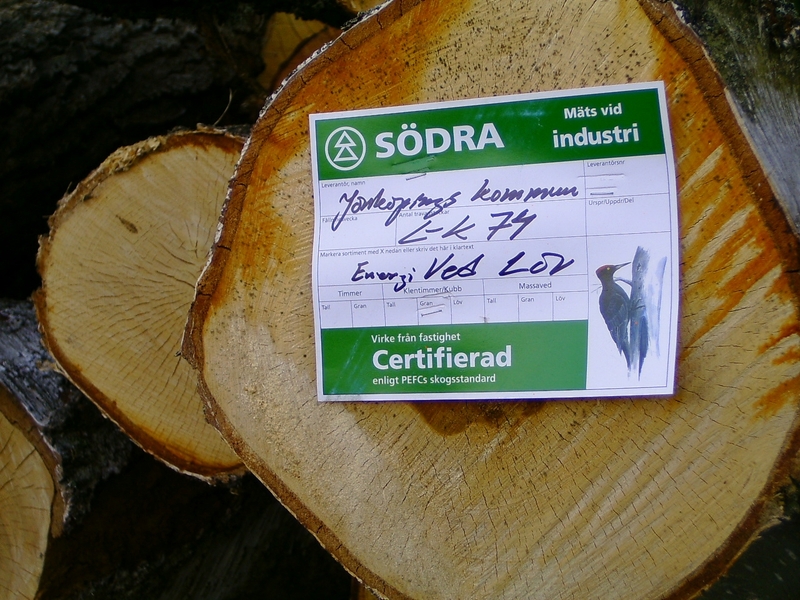 In early July the World Bioenergy 2014 conference takes place in Sweden. No Australians from state or federal government departments are likely to be there (none have attended since it has been running: every second year since 2004), or from conservation groups, energy companies, consultancies, universities or manufacturing industry. This year, however, Australia will be represented by three or four people. 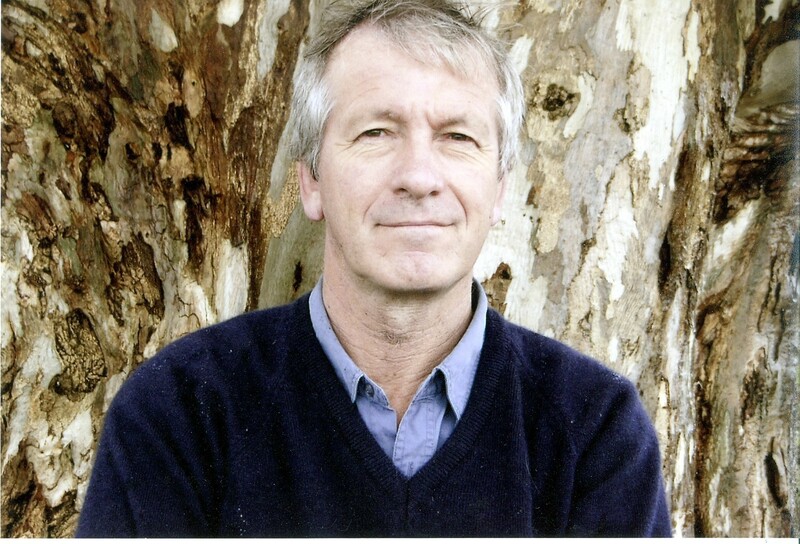 These include the author of this piece (who has managed to get to the last four conferences), a local government councillor from Tasmania, and a person involved with community, farm forestry and land-care in northern Victoria. The most energy-efficient way to access the conference city of Jönköping (pronounced Yernsherping) is by train from Stockholm (this is recommended by the conference organisers). The first part of this four-hour journey is in an intercity train cruising smoothly at about 160 km/hr and tilting on the curves. If you don’t know when to look you would miss seeing the new combined-heat-and-power (CHP) plant just south of Stockholm at Södertailje. One of many in planning or being constructed, this is fueled by wood chip and municipal solid waste. As well as putting 88 megawatts (MW) of electricity into the national grid it provides up to 200 MW of district heating into southern Stockholm’s apartment buildings and industry. The train passes through a number of cities of under 100,000 in population, each of which has power and heat coming from woody biomass, or from combustible non-recyclable municipal wastes, or with separate furnaces designed to be fueled by each but supplying a common turbine. The oldest of these CHP plants is where you change trains at Nassjö to take the train on the spur line to the conference city of Jönköping. This small CHP plant, built in 1984 was Sweden’s first purpose-designed woodchip-fueled plant, supplies this small city of 20,000 with all its electricity and heat needs, and the ash from the furnaces is spread back into the forests, where the fuel of woody residues came from. In smaller and larger cities, the putrescibles (wet organic) wastes including sewage go into anaerobic digestors, which might produce upgraded biogas for transport fuel or to go into the natural gas grid, or heat and electricity, or both. At Linköping, one of the cities we pass, upgraded biogas fuels a regular freight train service. The three-day conference at Jönköping is widely known as one of the world’s best of its type, and attracts up to 1100 people from up to 60 countries. Presentations cover the full array of bioenergy technologies at all scales, utilising many feedstocks to produce electricity, heat and transport fuels and other products, and covering all aspects of economics, environmental benefit, policy and sustainability. This year there is a parallel conference on bio-refineries, and so the products being talked about include the substitutes for most petrochemicals. Jönköping is a great place to have this conference for many other reasons. 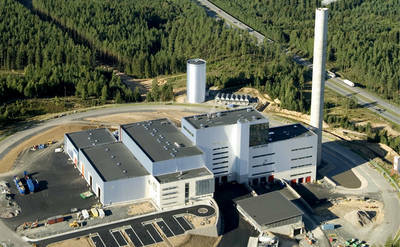 Conference participants can visit the modernistic Torsvik waste-to-energy plant located 13 km outside the city. This annually turns 160,000 tonnes of sorted combustible municipal waste into 30% of the city’s electricity and 50% of its peak winter heat needs. Within the city you can visit the anerobic digestor that converts the population’s putrescible wastes into upgraded biogas for the municipal fleet and private vehicles. Or you can take an afternoon bus tour to the nearby city of Växjö, rated as Europe’s ‘greenest city’, with its per capita GHG emissions of under 3.5 tonne. Here, over 80% of the municipal population’s domestic, commercial and industrial energy needs, including transport fuel and cooling, are sourced from biomass and waste streams produced in the municipality. Other afternoon excursions go to other bioenergy plants of all types, from small pellet producers to anaerobic digestors converting cow manure to biogas. Editor’s note: I am permanently befuddled as to the fact that this country, which has the most significant amount of renewable resources of all countries in the world, is the least progressive in this area. Props to the wonderful artist who provided the feature image. Nothing else seemed to fit. 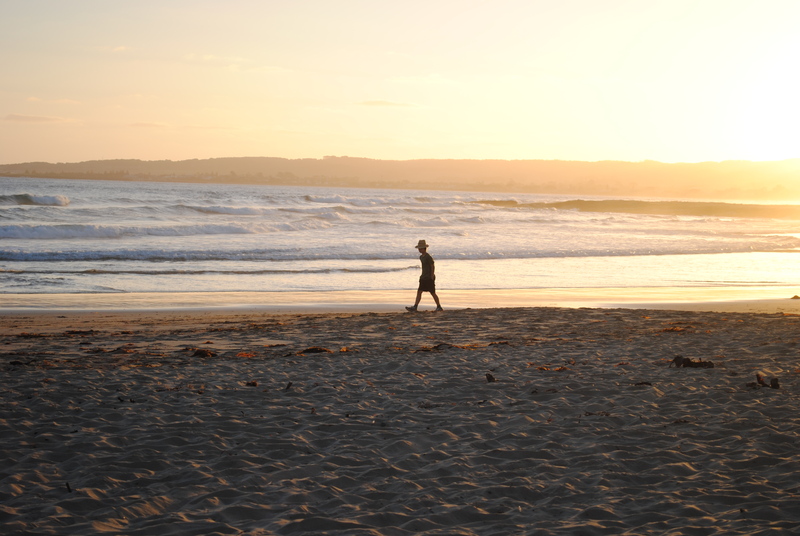 Also, that’s my young son above, walking along a beach, thinking (well, that’s what I assume he’s doing). I’d like to have a mind as uncluttered as his; I’d like to think we are moving towards something less calamitous than we know we are. As an addendum, Ted over-the-road sent me this photo and the following information; completely unrelated to this post but related to the mushroom analogy. “The Ghost Fungus was initially described in 1844 by English naturalist Miles Joseph Berkeley as Agaricus nidiformis. Material was originally collected by Scottish naturalist James Drummond in 1841 on Banksia wood along the Swan River. 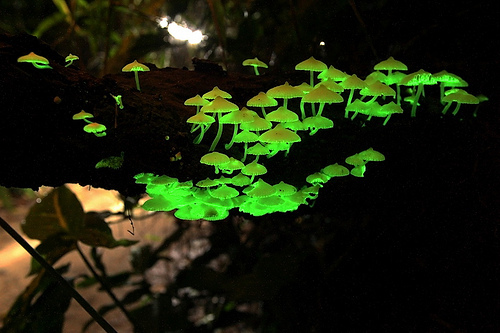 He wrote ‘when this fungus was laid on a newspaper, it emitted by night a phosphorescent light, enabling us to read the words around it; and it continued to do so for several nights with gradually decreasing intensity as the plant dried up’.” The Ghost Fungus is now identified as the species Omphalotus nidiformis. Sophie this is totally unfair – of course I remember this conference. It was the… umm… er… um… was it the residues to revenues conference in about 2010? Or possibly one of those renewable energy conferences at Bendigo about the same time? You were everywhere at this time actually getting paid to write articles. But why bring this up? And this thing about Scandinavians – you know they all hate the cold and snow and want to come here…But do we want them?